The Chevrolet area at the 2011 Detroit Auto Show was among the largest, running the length of the GM-devoted area of Cobo Hall and offering a look at the diversity of the brand – from the new Chevy Volt to the Silverado HD (2011 Motor Trend Truck of the Year) and everything in between. Chevrolet focused their Monday press conference on the debut of the sporty new b-segment compact, the Sonic. The new Chevy Sonic was originally debuted at the 2010 Detroit Auto Show as the Aveo RS Concept but as the Aveo name is phased out, the new Sonic will enter the market with aggressive styling in place of the vanilla look from the outgoing compact. To help draw attention to the Sonic, Chevy also debuted the Z-Spec trimline; featuring a sportier-than-standard appearance similar to the dressed-up Volt and Cruze that debuted at the 2010 SEMA Show. The next biggest news from Chevrolet is the 2011 Volt making its debut at the show as a full production model. The Volt has been shown off several times over the past few years but this is the first time that a consumer can come to the show, check out the Volt, then go to a dealership and buy one. There were a handful of Volts to sit in and check out, along with several gaming stations featuring a virtual drive in the Volt thanks to the Xbox Kinect system. The internet has been suggesting that the 2011 Detroit Auto Show would bring about the formal unveiling of the new supercharged Camaro Z/28 but it was not to be. 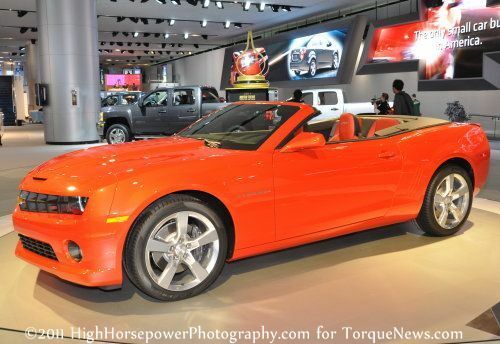 However, the 2011 Show introduced the Motor City show-goers to the new Chevy Camaro Convertible with an interactive station to have your picture taken with the new drop-top. In addition to these debuts, Chevrolet had the Corvette Grand Sport and ZR1, the new Cruze and the rest of the 2011 Chevrolet lineup for all to experience. Also, to show just how deep Chevy runs, there is a small collection of vintage models including a Chevy Bel Air. Check out the gallery below for a look at just a few of the Chevrolet vehicles from the 2011 Detroit Auto Show and with just 5 days left, this year’s Detroit show is worth the trip. The new 2011 Silverado HD is easily the new benchmark in diesel engine trucks that will be used to haul or tow something. Great comfort and really nice looking interior ( 2011-Silverado-HD.com for reference) are only going to increase the overall success this truck will have in the market. Chevy is turning the corner on quality and has now caught up to ( and maybe even passed) it's domestic and foreign competitors in quality and reliability.